Citation: C N Trueman "Trafford Leigh-Mallory"
Trafford Leigh-Mallory served in both World War One and World War Two. Leigh-Mallory, with the rank of Air Chief Marshal, was the most senior British officer killed in World War Two. Leigh-Mallory joined the army (the King’s (Liverpool Regiment) as a private but he was soon commissioned into the Lancashire Fusiliers. In the spring of 1915, Leigh-Mallory arrived at the frontline. He was wounded in the Battle of Ypres and recovered from his wounds in England. During this time he met Doris Sawyer whom he married. Leigh-Mallory was born on July 11th, 1892, in Cheshire. His father was a vicar and his elder brother was the mountaineer George Leigh-Mallory. Leigh-Mallory was educated at Haileybury and after this went to Magdalene College, Cambridge. At Cambridge, Leigh-Mallory met Arthur Tedder, the future Marshal of the RAF. Leigh-Mallory gained a degree in Law and planned to be a barrister. The outbreak of World War Onewas to change this plan. After recovering from his wounds, Leigh-Mallory joined the Royal Flying Corps early in 1916. By the summer his training was over and he flew bombing and reconnaissance missions during the Battle of the Somme. He gained his first combat command (No. 8 Squadron) in November 1917 and during the Battle of Cambrai No. 8 Squadron was involved in directly artillery fire and tank movement. Leigh-Mallory gained a reputation for efficiency and he remained in the newly formed Royal Air Force after the war had ended. He was rapidly promoted and passed through the RAF Staff College and commanded the Army School of Cooperation. Leigh-Mallory was eventually posted to the Army Staff College at Camberley. By the end of the 1920’s he was seen as an expert on how the Army and RAF could work together in warfare. In 1931, Leigh-Mallory was appointed the deputy director of staff studies in the Air Ministry and he was in the British delegation that attended the League of Nation’s inspired Disarmament Conference in Geneva. After the failure of this conference, Leigh-Mallory attended the Imperial Defence College. In 1935, he was posted to Iraq where he served as a senior staff officer. In 1937, Leigh-Mallory was given charge of No. 12 Group, Fighter Command. He made up for his lack of experience with fighter planes with enthusiasm and efficiency. He was never necessarily liked by his men but he was respected. In November 1938, Leigh-Mallory was promoted to Air Vice-Marshal. During the Battle of Britain in 1940, the different tactics employed by different Fighter Command groups came into the open. The commander of No. 11 Group, Keith Park, had charge of all of Southern England, ranging from Ipswich to Dover to Portland. Park wanted No. 12 Group to protect No. 11’s air bases while crews from No. 11 were airborne. Leigh-Mallory did not agree with this. No. 12 Group covered an area that included Hull, Liverpool, Birmingham, Norwich and Mid-Wales. 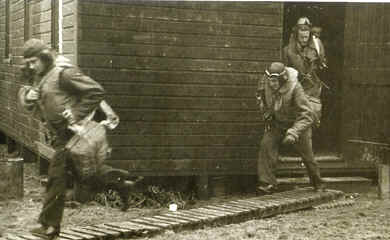 He saw no reason why his men should not hunt for German planes – as opposed to guarding No. 11’s air bases. Park held the view that German planes should be allowed to cross the Channel before being attacked whereas Leigh-Mallory believed that Fighter Command should actively meet the Luftwaffe as it approached Southern England. Park, supported by Hugh Dowding, believed that their way would result in fewer pilots being lost – Fighter Command could just about afford to lose planes – it could not afford to lose a single pilot. The new Chief of Air Staff, Air Chief Marshal Charles Portal, supported the views of Leigh-Mallory. When the battle was over, both Park and Dowding were replaced (November 1941) – one as head of No. 11 Group the other as head of Fighter Command. Leigh-Mallory became the commander of No. 11 Group and Sholto Douglas head of Fighter Command. In November 1942, Leigh-Mallory replaced Sholto Douglas as head of Fighter Command and was promoted to Air Marshal. In January 1943 he was made a Knight Commander of the Order of Bath. Leigh-Mallory’s view on the way the war in the air was being fought brought him into conflict with other senior officers in the RAF and the USAAF. Leigh-Mallory wanted a single commander of the Allied air forces – not a number of commanders of Bomber Command, Fighter Command etc. However, he was up against a number of powerful opponents who did not want to see a reduction in their power. In August 1943, Leigh-Mallory was appointed c-in-c of the Allied Expeditionary Air Forces for D-Day. It was his task to formulate the air campaign to support the ground troops for D-Day. In fact, some of his responsibilities were taken by Arthur Tedder, who was Eisenhower’s deputy for D-Day. With the Normandy success behind him, Leigh-Mallory was appointed Air Commander-in-Chief of South East Asia Command in August 1944. While journeying out to the Far East on November 14th, 1944, his plane crashed in the French Alps and he was killed, along with all on board.